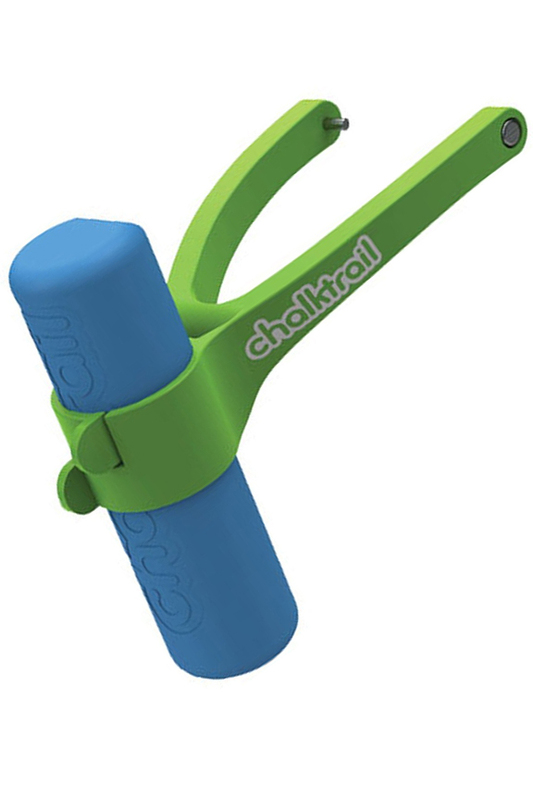 Quickly clip this chalk holder to almost any scooter, and allow the rider to draw colorful pictures as they roll down the street. It's so simple to use, kids can take it on or off themselves any time they want. Once in place, the clever design will keep the chalk against the ground, so colorful lines will mark the path of the scooter. It's plenty of fun for a single rider, but when multiple children team up, the collaborations can be amazing. Anything from racing paths to intricate geometric designs can be created by working together. No tools or hardware are required to attach it, and new pieces of chalk can be slipped in quickly and easily. It's compatible with popular scooter models, so you won't have to worry about it fitting. Each piece of chalk will last for up to 1.5 miles of scooting, and this set comes complete with one piece to get you started. Order extra pieces separately to extend enjoyment, and keep your kids outside, breathing fresh air, all summer long. Works With Most Scooters. The universal attachment easily hooks to a wide range of scooters. Use it on any razor style model. Easy Installation. No tools are required, and kids can do it themselves. A tension system keeps the holder in place, so just pop it on and get to scooting. Completely Reusable. A single piece of chalk will last for a mile and a half of riding, and it can be quickly reloaded with replacement pieces for non stop fun. You can also quickly move to another scooter without ruining it, or breaking out the toolbox. Loads Fast. Holds Secure. An easy to use system keeps a single piece of chalk in place at the end of the curved holder. Anyone can quickly unload it, or reload it because it requires little strength or effort, and it can be done in a just a few seconds. Chalk Included. A single piece of compatible chalk will be included with this set. You will be ready to roll when opening the package, but more chalk can be purchased separately to extend the enjoyment. Artistic And Athletic Get those creative juices flowing, and get your kids off the couch. They will enjoy the colorful creations so much, they won't even realize how physical it is. Parental guidance and assistance is not required, and there is no hardware necessary, or tools required. A simple wishbone-style clamp will connect to the center hub on the back wheel of the scooter you install it on. At the end, and towards the bottom, another clamping system will hold the chalk in place. It's safe and easy, so any kid can do it themselves, and any child will be able to put it on, or take it off as often as they want. The simple design offers obvious functionality, and allows any scooter rider the opportunity to turn roads and other flat surfaces into a gigantic canvas to express their creativity. With no complicated parts to assemble, or hardware to lose, putting this device on any scooter could not be easier. Just pull the the arms apart, align with the center of your rear hub, and then allow the arms to clamp into place. Once on the scooter, install a piece of chalk and set it to the right angle to complete the set up process. Stop boring your kids by making them ride regular things, and get them excited to go outside. Kids will spend more time getting physical, and less time sitting inside, and that will help to promote a healthy lifestyle and proper brain function. Make your child the envy of all other kids in the neighborhood, or team up with other families to set loose a graffiti squad to blanket the streets with youthful enjoyment. Uses Attach to any scooter to let kids draw as the scoot. Compatibility Works with razor style scooters. Heart pumping action and colorful creativity all in one. Give your kids another reason to get outside and play. Order Yours Today!